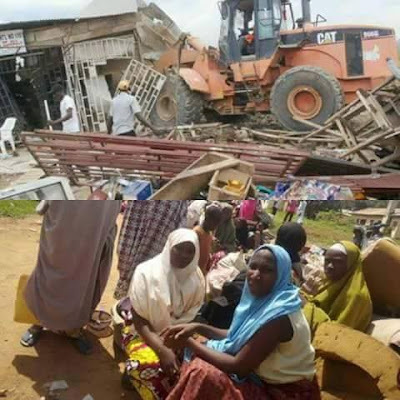 The Kaduna State Government has demolished some private houses built within the premises of public institutions in an effort to recover all government’s lands that were illegally taken over by individuals.The exercise commenced on Wednesday at Alhudahuda College in Zaria where over 93 buildings were completely pulled down. The demolition of the structures started after a three-week notice served on the occupants of such buildings by the state government expired. The notice was served on June 14. The General Manager of the agency handling the demolition, Mrs Saratu Haruna, who supervised the demolition exercise, said that the action was carried out on erring house owners who did not comply with directive of the State Government through her Agency. She explained that the three weeks notice served to them was enough for them to remove their structures and relinquish the land to the state government. The State Governor, Mr Nasir El-Rufai, reiterated that his administration would not stop its bid to recover all public lands that were illegally occupied or acquired by individuals at government owned schools, hospitals and other public institutions. In a statement by his spokesman, Samuel Aruwan, the Governor said the action was to ensure that public institutions had their lands back for further expansion. While owners of the demolished structures in Zaria are still nursing their pains , those with similar issue at Sarduana Memorial College, Rimi College and other public schools in the state capital, are already apprehensive, as some of the buildings there have also been marked for demolition in the days ahead. But some of the property owners insist they had genuine papers for the land. The demolition is the first among the several other ones that would be carried out in several public institutions across Kaduna. The state government is hopeful that the lands when fully recovered from the illegal occupants, would be handed over to the original owners for future developmental purposes.